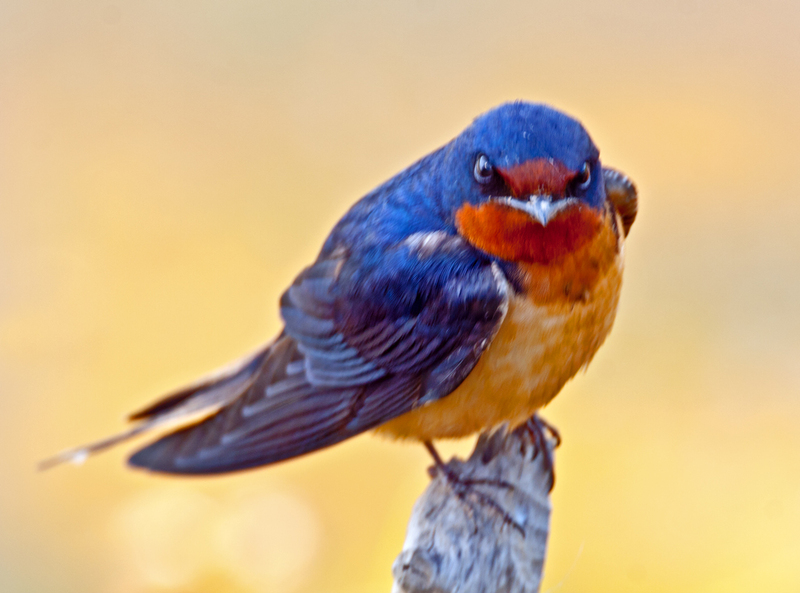 I hadn’t intended to do a head-and-shoulders portrait of this Barn Swallow (Hirundo rustica), but my telephoto zoom was near the far end when I carefully placed my tripod on the boardwalk and focused on the swallow. Sensing that the bird was not going to remain perched for very long, I quickly snapped off a few exposures. My left hand was adjusting the ballhead of my tripod and my right hand was pressing the shutter, so zooming out was not really an option at that moment. The image that you see is as much of the bird as I was able to capture. I did manage to get some good detail in the eye (and I recommend clicking on the photo for a higher resolution view) and I am happy with the background, which once again looks like a studio setting—it may not be very exciting, but it sure is uncluttered. I suppose that the lesson for me is to have my camera fully adjusted as I am sneaking up on birds, but sometimes “mistakes” turn out pretty well too. 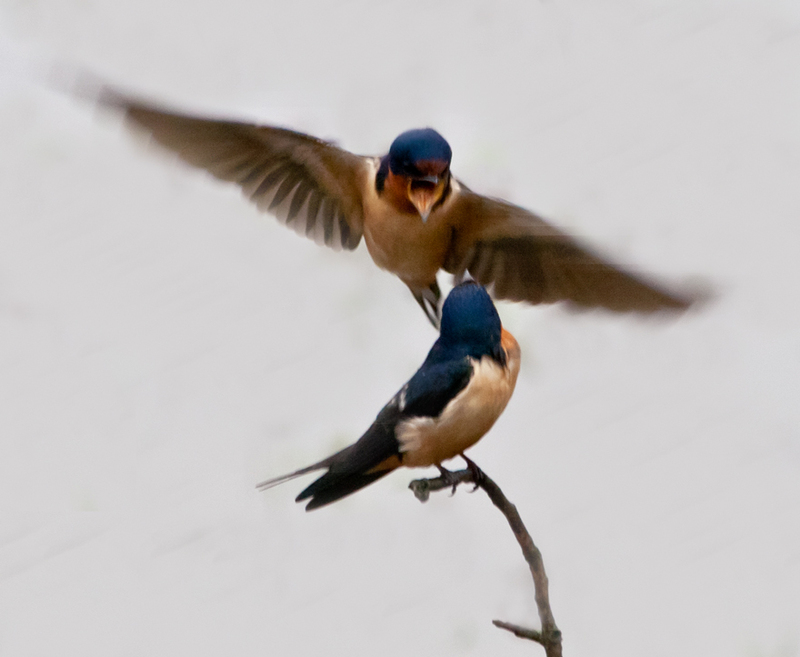 Are Barn Swallows normally hostile toward each other? I tweaked these photos in Photoshop Elements (and cleaned up the background a little) and was amazed to discover that this confrontation seems to have escalated a bit beyond the previous one. 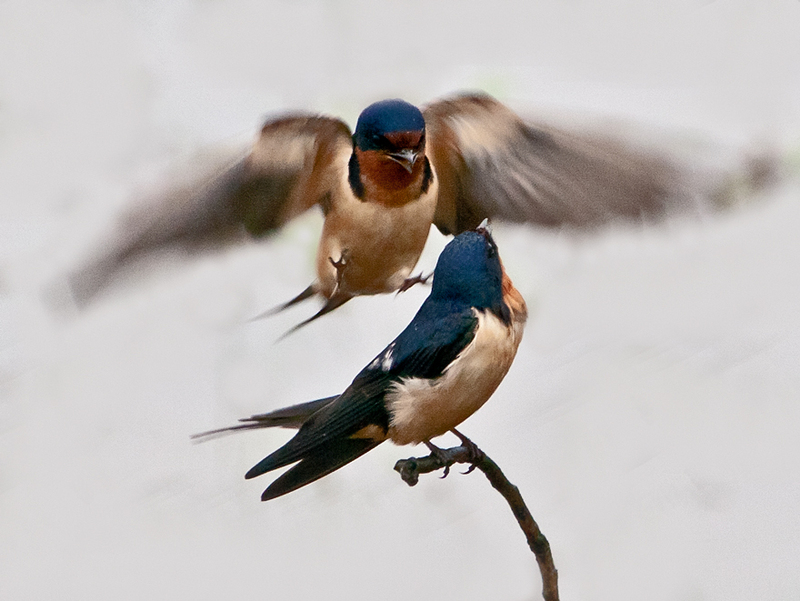 The flying swallow seems much more aggressive and threatening, going beyond the squawking I had seen before, and looking more like he was ready to attack the sitting swallow, who seems to be paying attention to the incoming bird. These photos would have been better with a higher shutter speed and better light, but I am amazed that I was able to capture this moment. I love interactions between members of the same species (and between different species) and I enjoy trying to catch those moments. 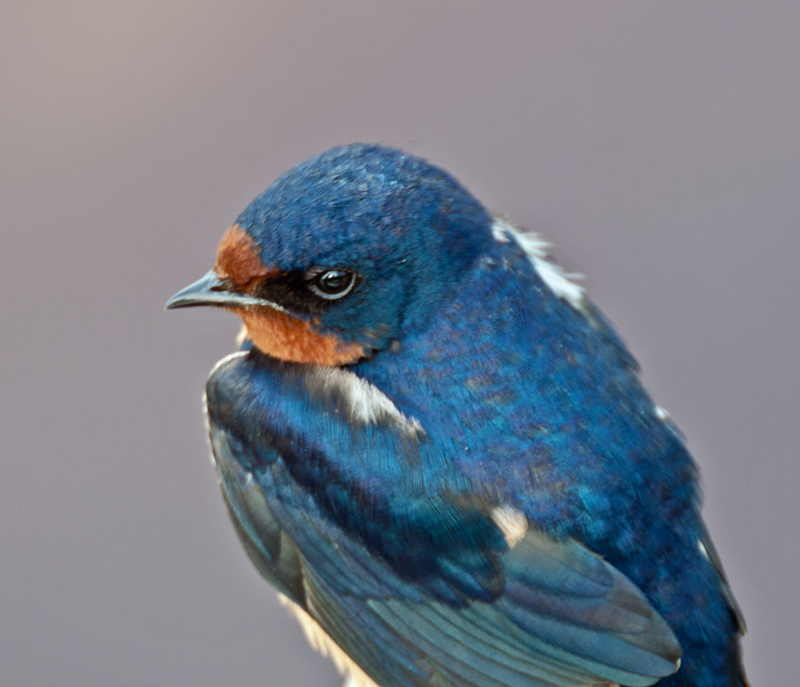 Here’s a photo of the Barn Swallow (Hirundo rustica) that I took today just prior to the confrontation that I featured in my previous blog entry. The sky was almost completely white, because the day was heavily overcast, and it totally disappeared when I was adjusting the RAW image. This was one of the first times that I used flash to add a little light and bring out the colores and it seems to have worked out pretty well. Some of the more dedicated bird photographers that I see use a Fresnel lens attachment for their external flash units to give more reach to the flash—I am not sure that I am ready to go that far yet. 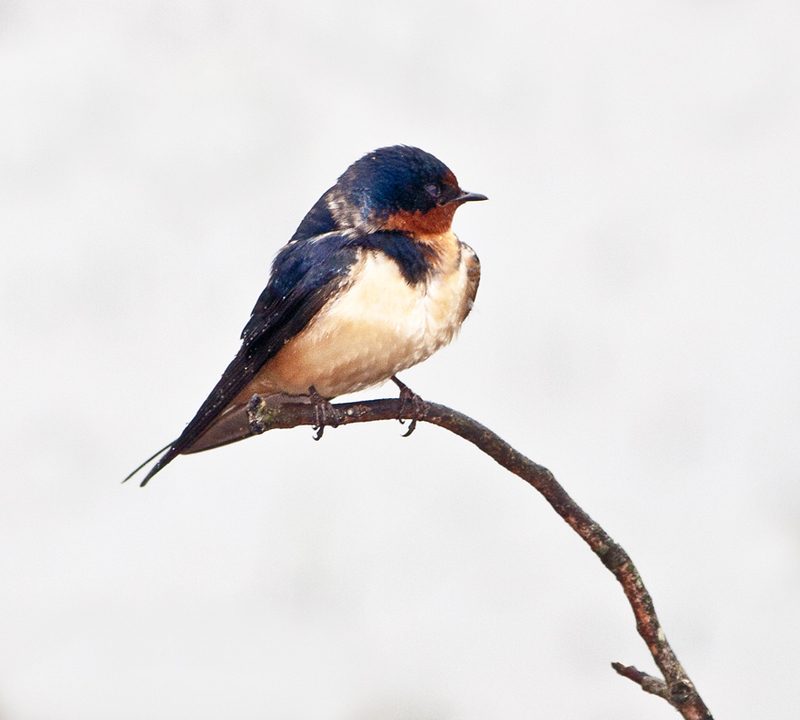 I managed to get a pretty good amount of detail in this shot, even capturing some of the raindrops on the swallow’s wing. 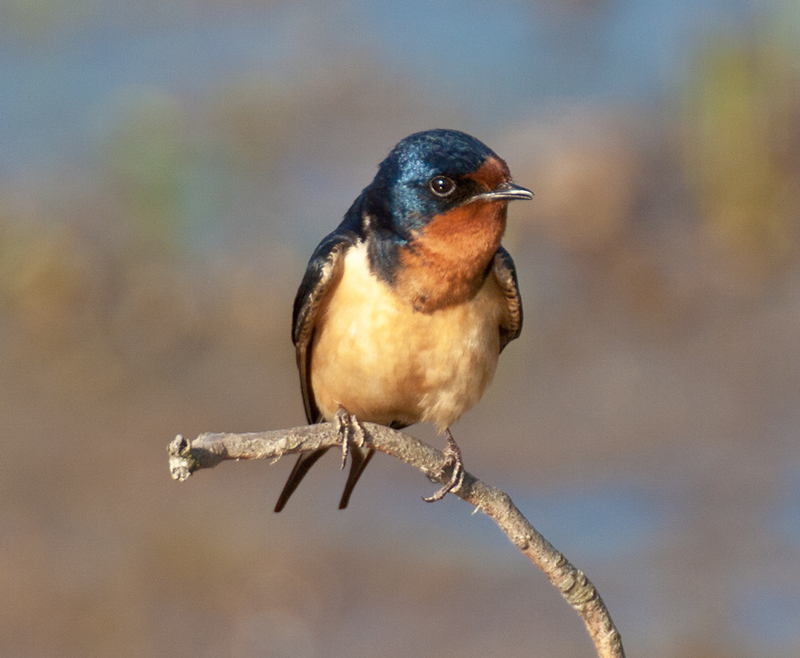 I was focusing my camera on a Barn Swallow (Hirundo rustica) perched on a branch, when out of nowhere another Barn Swallow appeared and started screeching as it hovered in midair. Fortunately I had enough presence of mind to press the shutter release. It was raining most of the day and I was shooting one-handed under an umbrella much of the time. For this shot, I decided to use the built-in flash on my camera to add a little additional light. 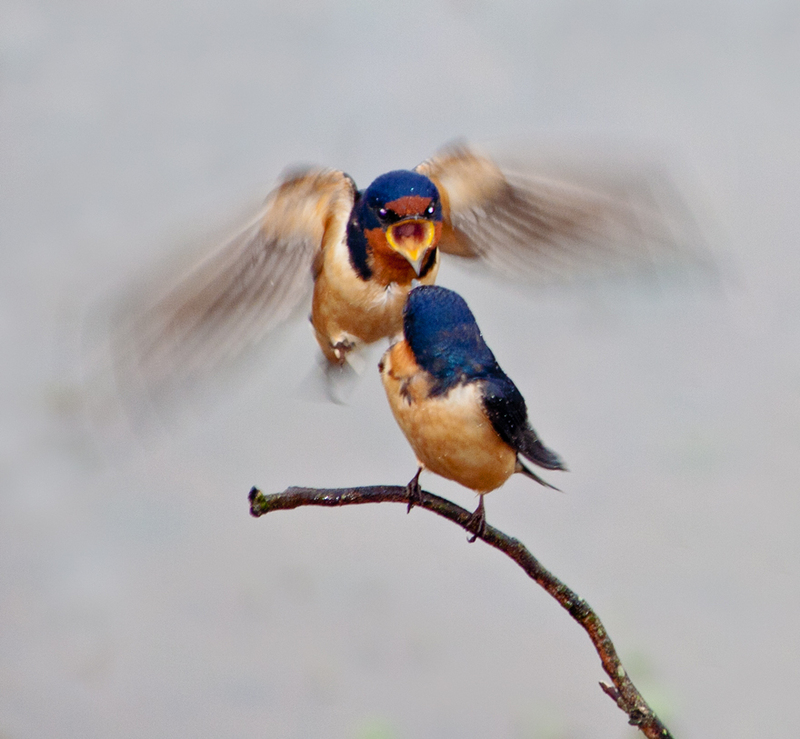 The reflections in the screeching bird’s eyes add to its almost maniacal look. The bird on the branch was totally impassive. 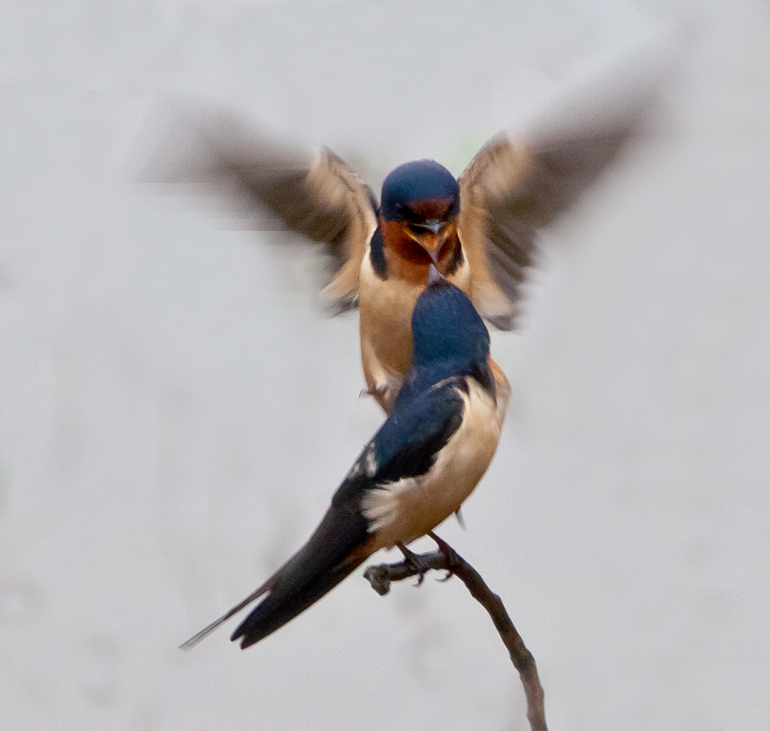 It turned its head toward the hovering bird, but did not appear to react in any other way. The overall feel of the image is almost like a cartoon. I really like the way it came out (and recognize that it was mostly luck and fortunate timing).